This Sunday’s Freshman Family Breakfast was incredible! 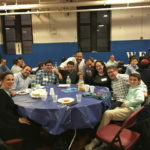 Our Freshman families had the opportunity to meet one another and enjoy breakfast with their sons and rebbeim and a competitive Panoply game. Thank you to everyone who joined us!